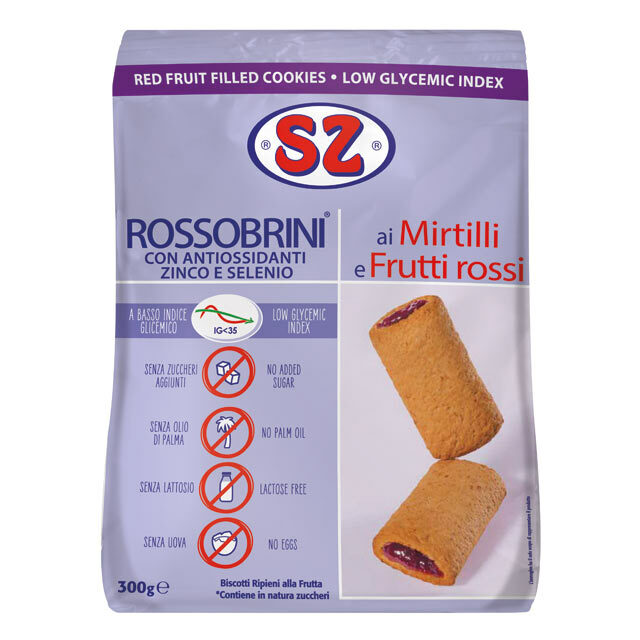 Rossobrini ®, soft biscuits with fruit filling, are produced with an exclusive recipe and a manufacturing process that allows to enclose and maintain inside the biscuit all the fragrance, the perfume and the taste of the blueberries and the red fruits . They are enriched with selenium and zinc antioxidants that contribute to the protection of cells from oxidative stress. Cookies with fruit filling, no added sugars, with sweetener. Ingredients: flours (wheat, whole wheat), fruit filling 28% (sweetener: maltitol syrup, cranberries 14%, strawberries 7%, red currants 7%, jellying agent: pectin, acidity regulator: citric acid, flavours), sweeteners: maltitol and maltitol syrup, sunflower oil, carrot juice, potato starch, inulin fiber, emulsifier: soy lecithin, flavours, salt, raising agents: sodium acid carbonate and ammonium acid carbonate, zinc gluconate (zinc 4.3 mg in 100 g of product), antioxidant: extract rich in tocopherol, sodium selenite (selenium 24 μg in 100 g of product). Contains soy and cereals with gluten. May contain traces of nuts and milk products. Contains natural sugars. Excessive consumption may have a laxative effect. Keep in a cool and dry place. Produced in Italy.